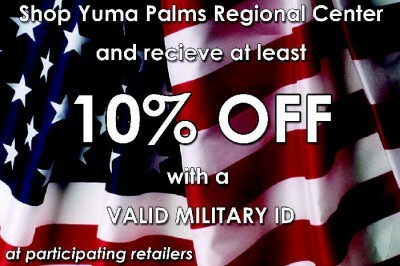 Military Discounts - Yuma Palms Regional Center – Yuma, Arizona | Welcome To Yuma Palms!Yuma Palms Regional Center – Yuma, Arizona | Welcome To Yuma Palms! Thank you for your service! Click image to see the list of many retailers who offer this special discount!